In fuel cells technology, electrochemical process is involved to convert energy from hydrogen, natural gas, ethanol or biogas. 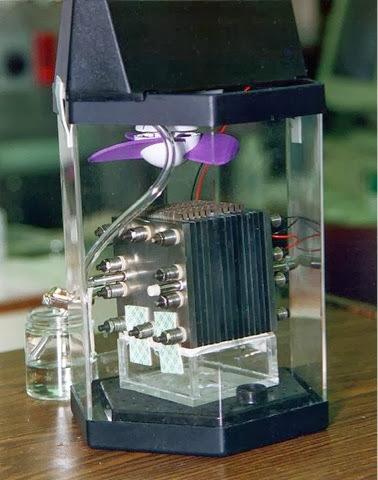 Demonstration model of a direct-methanol fuel cell. The actual fuel cell stack is the layered cube shape in the center of the image. Image source. In a latest development, Microsoft says it is considering the use of fuel cells to power data centers, saying that its studies find it a technology with much potential. According to the studies by the IT giant, fuel cells are much cheaper than high voltage switchgear, transformers and copper cables, and have no moving parts, unlike generators. Where fuels are distributed in a data center, and placed at the servers and racks, it is possible to completely eliminate the power distribution system in the data center, including the power backup generation. If a fuel cell fails it only affects a small part of the data center, the report reasoned. The paper, boldly titled "No more electrical infrastructure: Towards fuel cell powered data centers," investigates fuel cells as a centralized power source and as distributed power generation technology with fuel cells used at the rack or single server cabinet level. There is broad industry interest in fuel cells. In September, eBay unveiled a data center in Salt Lake City Utah that uses fuel cells made by Bloom Energy. But overall, use if the technology in data centers remains far from mainstream. Sean James, a senior research program manager at Microsoft's Global Foundation Services and an author of the study, said in a blog post that he sees "tremendous potential" in fuel cells, though "deep technical issues" remain. Technical issues, such as the fuel distribution system, power management and even safety training, remain to be resolved. Nonetheless, James argues, in time, "you may end up with one someday delivering clean electricity and heat to your home" via fuel cells. The paper looks at running an entire data center on fuel cell technology and decoupling data centers from the electric grid. If fuel cells use natural gas, the buried lines delivering it are "not subject to severe weather."